Case in point: an entrepreneur steps into my office in need of some graphics and print material for a pressing project. A sales opportunity has just come up and has taken them by surprise. They need a brochure, or a sales sheet, or perhaps a new trade show display. But they need something quick. They are in such a hurry that they need to make this meeting brief so they can get on to the next fire. Deer in the headlights. Pause. Followed by stuttering, incomprehensible noises, and another uncomfortable pause. Of course, I do not say this outloud. I am only thinking it to myself. True confessions. I have been there–in that same place–and I am in marketing. (Paper-sack-over-head-with-two-holes-cut-for-my-eyes-blink-blink.) But think about this. If you, the business owner, do not know what to say about your own product, how will anyone else know what to say, when they know less about your product than you do? Sure I can make your materials look great. That is easy for me, and it is my job. But no matter how beautiful the design, without a strategy, your materials will net you zip zero nada nothing. If you think advertising is expensive? Try advertising that does not work! If you left my office right now, threw several hundred dollars out of the window on your way back to your office, flaked off all responsibilities and took your spouse out for a fancy dinner, that would be less expensive than buying a brochure that yields no results. I so wish a pill could fix this. But in all reality, I know that speechlessness is only symptomatic of a deeper issue. You are chasing sales–not solving a problem. If there isa problem that your product can solve, you are not sure what that problem is. If you are not sure what the problem is, you cannot identify anyone who has the problem (in other words, anyone who could use your product). And without knowing what the problem is, you cannot be confident that your product is the best solution. And without confidence, you will never sell anything. Do you have symptoms of Entrepreneurial Speechlessness? It is the result of placing Advertising before Strategy, or putting the shopping cart before the horse. Get back to the bedrock issues of Purpose, Vision, and Mission. Until you are a believer in your own product, you will remain speechless. I want to help remove the lack of clarity that is stealing your voice. Make sure your product is not just a product of your imagination. Make sure it is something that will change the world, and become a believer. Remove every trace of doubt in your mind, and you will have plenty to say. You will not be able to stop talking about it if you try. 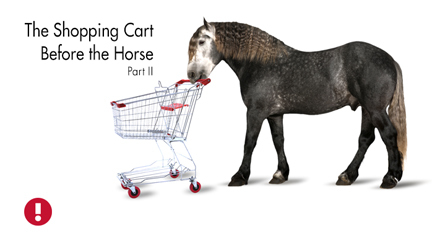 Stay tuned for Part III of The Shopping Cart Before the Horse, next week! We do our best here at Etc Graphics to play devil’s advocate with our small business clients. We really are not trying to cause any trouble. Well . . . maybe. But trouble in a good sort of way. So virtually every startup we work with will eventually hear the question: So what is your USP? What in the world is a USP you might ask? This acronym stands for Unique Selling Proposition. A USP makes clear differentiation between you and the competitor. Your competitor cannot say it. Only you can say it. Easy to come up with? No. But since we began business 25 years ago, any entrepreneur who could clearly state their USP off the cuff is still with us today. Since we want to see every small business survive and thrive, we continue to ask this clarifying question over and over again. We cannot say enough about the value of clarity when branding a business. I’m thinking about the Iowa State Fair for an example of a strong brand. So much of the Fair is the same year to year, with certain things us locals must see and eat and do that only the Iowa State Fair can deliver. We love it for that reason alone. But each year, there is also an element of surprise. Perhaps we happen upon a live musician that rocks our socks off, or find a demonstration that shows us a way to upgrade our lives. There is always a serendipity. We love the Fair for that too. This is exactly how a strong brand should behave. Mostly predictable, but with a decided twist. And this how brands worm their way into our hearts and minds: with a strong story, a clear mission, and an element of surprise. There are many clarifying statements that every business needs, besides the USP. Mission. Vision. Brand Promise and Position. Yet many entrepreneurs struggle with them. To the new business owner they seem unimportant– considering the other more pressing things that are on their to-do list. What these statements do, however, is provide clarity. Clarity to the rest of the world, yes. But most of all, to you. When the immediate answer to our questions is as clear as a bell, we know a company’s advertising will also resonate far and wide. Going through the motions just to say “I did it”. Symptoms: Branding Statements are like a dull knife, with unclear descriptions of the real unique value that you are placing on the table. Like a bad novel, the statement defines no real problem and delivers no satisfying solution. No one is moved, compelled to buy, and no one wants to read the sequel. Point: Read your Branding Statements to someone who does not know anything about your business. If they do not understand what it means, no one else will either. Symptoms: The Statements sound like blah blah blah. They are not written in language anyone would actually use- like they were developed in a Board Room (Bored Room?). You could not deliver them as an elevator speech without sounding like a complete snob. No one, after hearing the ‘speech’, asks you any questions. Point: These statements are for you first, others second. They help you clarify your own business. Revise the statements for you, until they sound like something you could say to anyone, like Fanfare for the Common Man. Feigning you are the best. Symptoms: Claiming to be so. Not only does this cast immediate doubt upon the veracity of the rest of what you have to say, but you may also be fooling yourself. Point: Success is found in being the best company you can possibly be, having systems in place to ensure continual improvement, and by being completely open and honest with internal and external customers. Symptoms: Almost any company could say the same thing. Contains words and phrases such as “quality” or “maximize ROI”. The statements could apply to most any industry. Statements lack memorability. Point: Find out why your customers buy. If you have never asked, the answers may surprise you. Your statements should contain this unique raison d’etre, and provide compelling reasons to buy that no one else can copy. Emulate yes- THAT is a compliment. But copy, no. Being different for different’s sake. Symptoms: Trying to be so avant-garde that no one can understand what you do at all. Point: The point isn’t to just be different. The point is to determine, on purpose and by design, to place real value in the hands of the customer that no one else can match. Clarifying your purpose should never take the back burner. A real mission is the “something” that fills the veins of a company. It is the “something” that is reflected in your culture and story, and infuses every product that goes out the door. It is the DNA that makes your company what it is, defined on purpose, and for a purpose. If you are having a lot of trouble refining the statements for your business, take a step back. Review your foundations and the big why of “why you do what you do”. Your statements will be clear when the reason why you unlock your door every morning is clear. And then, you too can become decidedly different. Summertime is music time in Central Iowa. From Jazz in July, to 80-35 Music Festival, to street musicians on every corner at every local Farmer’s Market. To celebrate July 4th, the Des Moines symphony plays the 1812 Overture, and the hills are alive. With the sound of live cannons! Jazz in July here in Iowa is a favorite event. I have believed for a very long time, that the Jazz is a beautiful model for business management. Why? It is easier for me to show you than to tell you. Many small business owners know they are suppose to have these guiding-light management principles in place: Mission Statement, Vision Statement, Strategies and Tactics, USP, Brand Promise, etc., etc., and yet, at the same time, many entrepreneurs never get around to writing them. Many question the value of such statements. First of all, they are hard to write. Secondly, any experienced entrepreneur knows that trying to predict the future is pretty much a crapshoot. So they feel if they spend the time to write them at all, it will just mean they will just need constant updating, all of which is just more work! But much of this confusion happens because they do not understand what these statements are suppose to do in the first place. These Statements are actually very very simple. If you find examples online that sound like blah blah blah? Run for the hills. Because that is what these examples are. Useless blah blah blah. If your Statements are never polished enough for the public to read them? That is completely fine. They should be simple enough to be used. Presenting the ultimate management model: the Jazz Chart. Are you a jazz fan? Have you ever seen a jazz chart? I received this chart from a young local musician. The Jazz chart holds all elements of a song together without dictating each and every move. The red circle on this jazz chart? Do you know what these measures represent? Here it is, it is suppose to be music, and there are no notes! There are just little slashes. A jazz score does not dictate every note that the artist plays. These slashes mean anything is permissible for the player as long as he/she stays within the provided structure. So what is it that the chart does show? It shows the key structure. It shows the tempo. It shows the melody, and critical elements- the basic structure, just like the Business Statements will do. All of the actual performance is generated in real time. Jazz players improvise their way into the future, in friendly collaboration with the other players. The chart provides just enough structure to provide the ultimate freedom to be creative. The chart enables every player to be fulfilled as a musician, and yet achieve the goal. It’s a beautiful thing. So how does this all relate? A Vision Statement is like a snapshot of what your business will look like when it is all grown up. So it’s like the song you choose to ultimately play. Strategies are the goals you set to accomplish that Vision. So a Strategy is like the chord structures and the tempo and the key signature. Tactics are the individual methods used to achieve the goals- they are like the instrumentation choices. The Mission is why you play that song in the first place. A Unique Selling Proposition is the thing you can say that your competitor cannot say. In other words, it is how and why you can play this song better than anyone else. A Brand Promise is what your product will perform for a specific customer. So your Brand Promise makes the audience glad they bought the ticket for the show. So instead of laboring over your Business Statements, try adopting a simple Jazz structure for you business. Forget hover management. Write those Statements- even if they remain only a rough draft. It will make your life easier, not harder. Free yourself. Just be cool. And all that Jazz.